VANILLA SCOOP Although long considered a product that originated in ancient Mexico, vanilla - which is extracted from beans such as these - was used by Middle Easterners around 3,600 years ago, a new study finds. DENVER - Three jugs placed as offerings in a roughly 3,600-year-old tomb in Israel have revealed a sweet surprise - evidence of the oldest known use of vanilla. 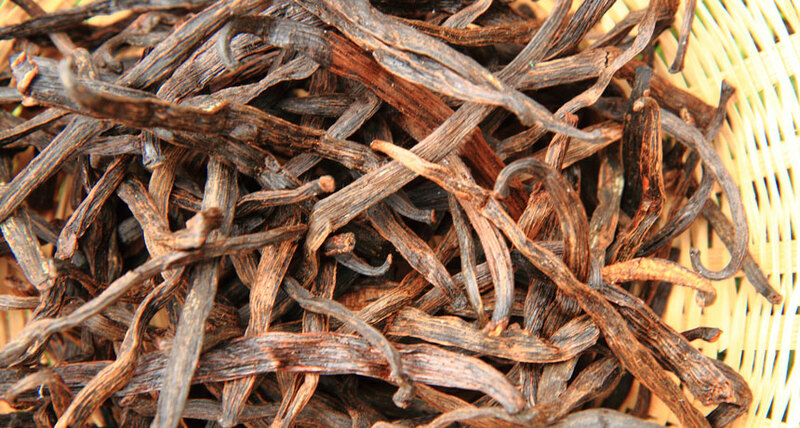 Until now, vanilla was thought to have originated in Mexico, perhaps 1,000 years ago or more. But jugs from the Bronze Age site of Megiddo contain remnants of two major chemical compounds in natural vanilla extract, vanillin and 4-hydroxybenzaldehyde, said archaeologist Vanessa Linares of Tel Aviv University in Israel. Chemical analyses also uncovered residues of plant oils, including a component of olive oil, in the three jugs. "Bronze Age people at Megiddo may have used vanillin-infused oils as additives for foods and medicines, for ritual purposes or possibly even in the embalming of the dead," Linares said. She described these findings at the annual meeting of American Schools of Oriental Research on November 16. Vanillin comes from beans in vanilla orchids. About 110 species of these flowers are found in tropical areas around the world. The chemical profile of the vanillin in the Megiddo jugs best matches present-day orchid species in East Africa, India and Indonesia, Linares said. Extensive Bronze Age trade routes likely brought vanillin to the Middle East from India and perhaps also from East Africa, she suggested. "It's really not surprising that vanillin reached Bronze Age Megiddo given all the trade that occurred between the [Middle East] and South Asia," says archaeologist Eric Cline of George Washington University in Washington, D.C. But no evidence exists of trade at that time between Middle Eastern societies and East Africa, says Cline, who did not participate in the Megiddo research. Vanilla orchids or their beans probably reached Megiddo via trade routes that first passed through Mesopotamian society in southwest Asia. However Bronze Age Middle Easterners ended up with those products, discoveries at Megiddo challenge the idea that vanilla use originated only in Mexico and then spread elsewhere, Cline says. The vanillin-containing jugs at Megiddo came from a tomb of three "highly elite" individuals who were interred with six other people of lesser social rank, said archaeologist Melissa Cradic of the University of California, Berkeley, a member of the current Megiddo research team. Excavations uncovered the tomb in 2016, Cradic also reported at the ASOR meeting. Primary burials in the tomb consist of an adult female, an adult male and an 8- to 12-year-old boy. Elaborate types of bronze, gold and silver jewelry were found on and around the three skeletons. Exact replicas of several pieces of jewelry appeared on each individual. The tomb lies in an exclusive part of Megiddo near a palace and a monumental city gate. "We can't definitively say that these three people were royals," Cradic said. "But they were elites in Megiddo and may have belonged to the same family."